[PDF] Putin's Wars: The Rise of Russia's New Imperialism. | Free eBooks Download - EBOOKEE! [PDF] Putin's Wars: The Rise of Russia's New Imperialism. Description: This book offers the first systematic analysis of Putinâ€™s two wars, placing the Second Chechen War and the War with Georgia of 2008 in their broader historical contexts. Drawing on extensive original Russian sources, Marcel H. Van Herpen analyzes in detail how Putinâ€™s wars were prepared and conducted and why they led to allegations of war crimes and genocide. He shows how the conflicts functioned to consolidate and legitimate Putinâ€™s regime and explores how they were connected to a third, hidden, â€œinternal warâ€ waged by the Kremlin against the opposition. The author convincingly argues that the Kremlinâ€”relying on the secret services, the Orthodox Church, the Kremlin youth â€œNashi,â€ and the rehabilitated Cossacksâ€”is preparing for an imperial revival, most recently in the form of a â€œEurasian Union.â€ An essential book for understanding the dynamics of Putinâ€™s regime, this study digs deep into the Kremlinâ€™s secret long-term strategies. Readable and clearly argued, it makes a compelling case that Putinâ€™s regime emulates an established Russian paradigm in which empire building and despotic rule are mutually reinforcing. As the first comprehensive exploration of the historical antecedents and political continuity of the Kremlinâ€™s contemporary policies, Van Herpenâ€™s work will make a valuable contribution to the literature on postâ€“Soviet Russia, and his arguments will stimulate vigorous debate. 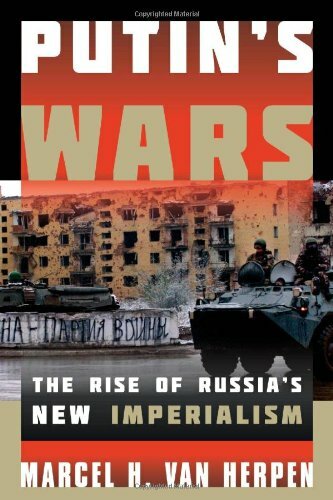 No comments for "[PDF] Putin's Wars: The Rise of Russia's New Imperialism. ".